We were excited when Dr. Nina Seigelstein, a former client, brought this pro bono project to our attention. Dr. Seigelstein has championed the cause of pre and post natal care for women in Western Africa for a number of years. Sierra Leone is located in a tropical climate on the west coast of Africa. The country is showing signs of successful transition after emerging from a protracted 11-year civil war. However, Sierra Leone's statistics for infant mortality and maternal deaths are among the highest in the world. Providing medical facilities with trained personnel and equipment is integral in helping the women and children of Sierra Leone survive. The government instituted free health care to be provided to pregnant women/new mothers; however, it is simply out of reach to the people in the more rural areas of the country. 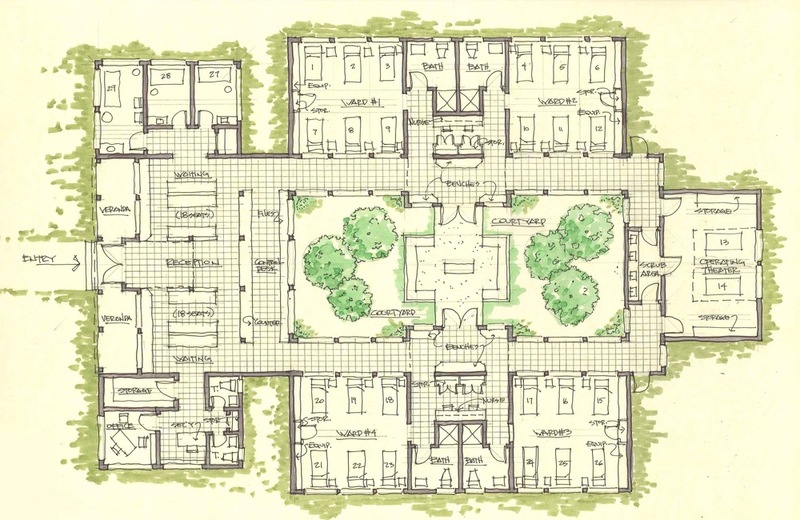 Above are schematic documents showing a new 7,500 square-foot. Pre & Post Natal medical clinic in Makeni, Sierra Leone. The Maternity complex includes waiting and administration areas, hospital wards, and an operating theater organized around a central courtyard space. Due to the challenges of the location and climate, the limited resources readily available, the design was driven by the need of natural ventilation, the use of local materials, as well as labor provided by members of the community, that would not necessarily have previous construction experience. The building sections and plans allow for adequate cross ventilation throughout with the exception of the operating theater which was the only space to utilize air conditioning. All building tectonics involve locally wrought technologies such as on-site truss and concrete masonry construction. We are thrilled to see that this project is in construction, and are proud that our work was deemed critical in fund raising and the eventual approval for this vision to come to fruition. When an early 20th Century Classic 3-story building needed to have its monotonous 1960’s storefronts rejuvenated we took a “proportionate approach”, influenced by Mondrian's "Composition II in Red". Two narrow storefronts became a theme and variation on the rectilinear frame and panel constraints of the existing façade. Update the finishes to automotive grade paint and you’ve got enough charm and punch to get attention in a location that was drab and dull. Adding an additional level of charm at Red Bank Sub Shop is the urban-oasis dining patio. A peek out the back door and you’ll find yourself outdoors and off the street at your own table for two. Blue sky above, a great simple meal at your table – aaah, that’s a downtown lunch! Simple graphics. Punchy color scheme. A nice little open roofed dining room. Just enough. Red Bank Sub Shop has recently opened for business! Grab a sub and check out the hidden patio!